Your Queen Kitty will be quite excited once she notices this Arthur Court cat treat jar on your countertop. 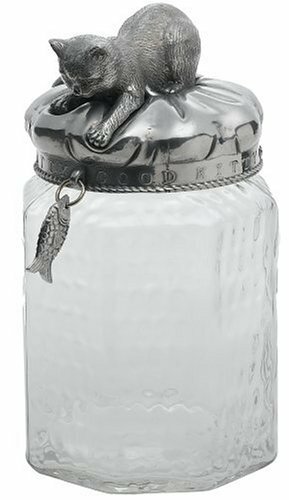 This whimsical jar features a textured glass vessel reminiscent of honeycomb, coupled with a fun croutching cat design lid complete with a hanging fish, which she can pursue. The rubber gasket and plastic threads underneath create a snug fit and an airtight seal. This canister will store your "fur person's" favorite treats while looking quite cute and playful on your countertop. The metal is manufactured using Arthur Court's signature premium aluminum alloy.